Casimir-Orient est un duplex en bord de mer exquis situé dans Emerald Isle, le sud des Outer Banks, en Caroline du Nord. Cette maison de vacances est parfait pour tout type de rendez-vous loin. Découvrez les vacances en famille ultime pour tous les âges. Mis à part la promenade privée à la plage, Cassimir Est est entièrement équipée avec des jouets de plage, une piscine de quartier privée (à seulement 2 minutes à pied), et des zones de couchage allant d'un berceau à un lit king-size. Nouvelles mises à jour de literie et de meubles en 2017! (Photos mises à jour en 2017) Notre maison est située dans le quartier exclusif de Spinnaker's Reach, en toute sécurité loin de toute route très fréquentée. Profitez du garage fini dans une salle de jeux équipée d'une télévision, table de ping-pong, salle à manger, casse-tête, jeux et plus! Ce secteur inclut même un réfrigérateur normal pour l'entreposage additionnel de nourriture et de boisson, grand pour griller dehors. Vous voulez une escapade romantique? Casimir-Orient est idéal pour les couples qui veulent profiter de la baignoire jacuzzi dans la chambre des maîtres, des balcons privés, et de la disponibilité à la location toute l'année. En outre, l'expérience des vacances sans souci avec notre service de linge gratuit. Les lits seront faits à votre arrivée et vous pourrez commencer votre détente immédiatement! Location was great! House had many amenities. Few minor maintenance items to be looked at, but expect with normal wear and tear for a rental. I would return ..
Beautiful Home, Charmingly Decorated. Perfect Location, Beachfront. Very large, spacious, beautiful home with a beautiful view. Clean and had very nice bed linens and towels. Home was stocked with about anything you would need. Owner was very pleasant and easy to communicate with. I would recommend this rental to anyone and I would come back. There are lots of steps, if that would be an issue to you. Thank you so much for your wonderful review of Cassimir East. I am so thrilled to hear that your family enjoyed their week at the beach and the views! We look forward to having you back again (and be sure to ask about our repeat guest discount!). No blinds or shades in one bedroom and the living room. Broken and stored in bedroom closet. Slats were the 2inch in width and about 6or 7missing. So sleeping when the sun came up was difficult. Nails kept popping up on the deck and steps and we would hammer them down as boards on deck would also rise. Told everyone not to walk with bare feet. I am so sorry to hear of your disappointing stay at Cassimir East. I must say, I was quite shocked to see a one-star review. We strive to have each of our guests have a stay worth a five-star review. We would have been happy to address some of these issues during your stay to make it as enjoyable as possible, however we were never notified of any issues during your stay and were not given the opportunity to make it right for you, which is disappointing. Since your stay, you would be happy to know that we have addressed many of these concerns, including new window treatments in the bedroom, new deck furniture and updated picnic table. This fall we also will have a brand new washer/dryer as well as replacing the decking and walkway to the beach as well as other improvements. Negatives: deck furniture awful (that’s where we wanted to spend our time but the arm of the rocking chair was literally taped on), for the price the house you’d expect it to be more updated, especially kitchen. Bedrooms were ok. Washer and dryer pretty bad. Overall we enjoyed our stay and in comparison I think the price is high for what you could get elsewhere but maybe that’s just Emerald Isle. Thank you so much for taking the time to provide valuable feedback about your 4th of July stay at Cassimir East. I’m glad you enjoyed your holiday week in Emerald Isle. We take feedback very seriously as we strive for each of our guests’ stay to be worthy of a five-star review. In order to do so, it is most effective for us to receive the feedback during the stay so that we can remediate any issues that are hindering your ability to enjoy your week. We would have been happy to come fix the deck furniture or address any other specific issues you may have experienced. As people who enjoy cooking dinners together with our family when we’re at the beach, we pride ourselves on having a fully equipped kitchen, making this possible for our guests as well. We have received compliments from others on a well equipped kitchen. We will take a look at the knives, since we regularly update our set, but with most rental homes, some items seem to grow legs and/or get misplaced throughout the course of the busy season. We will look forward to continuing to update our property this off-season, including some new appliances, deck furniture and other updates. My family of six with four young kids had a wonderful time at Cashmere East. The owners were wonderful in accommodating our schedule and had great communication. The house was well kept and the beach access made it super easy for our young kids and nap schedules. The kids loved the downstairs game room and the pirate ship themed cubby area under the stairs. We even saw dolphins! We will definitely return to Cashmere East during our next trip to Emerald Isle. Wonderful, whimsical home with great ocean views! We instantly felt at home in this charming duplex filled with great books, fun quirky art, and a well appointed kitchen. We can attest to great views of both sunset and sunrise! The house more than met our expectations and the owners were responsive with emails and booking details. We would definitely book again. The house was clean throughout, and the linens and towels were fresh. The kitchen was very well stocked with a wide array of cooking utensils, decent knives, spices, and basic pantry supplies. We had one bulb burn out while there and easily found replacements in the cleaning closet. 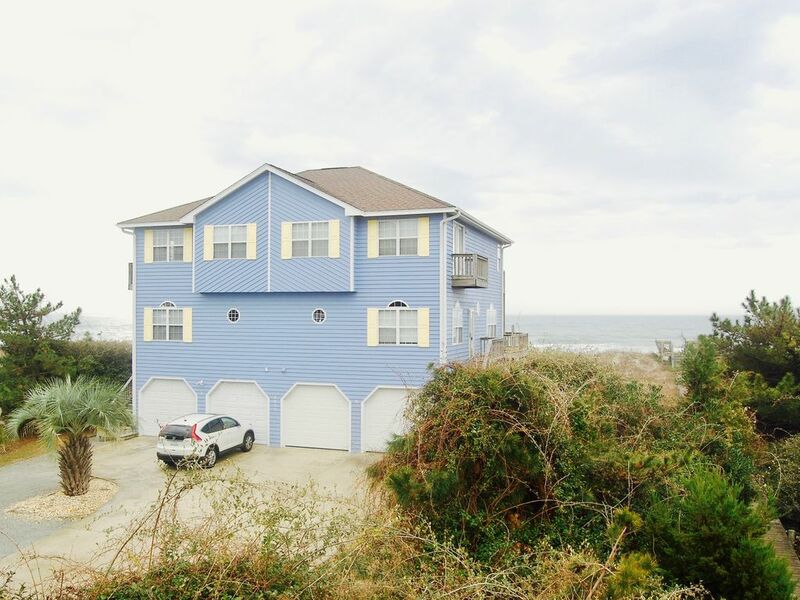 The ocean views and the sound of the waves from the living room, deck, and upstairs master are fantastic. The house is on the ocean with only a short walk from deck to beach (note - there are stairs). The beach area was quiet (it is Feb.) so few tourists. The locals are friendly. We found an abundance of shells. The neighborhood around the house is also charming and well maintained. We saw many people out walking . The neighborhood consists of single family homes and duplexes so the density is low compared to other areas nearby with high density condos. I imagine this keeps the beaches a bit less crowded in the summer. The house is a duplex, and the other half was occupied while we were there. We did not hear the neighbors so we think the soundproofing between units is good. Like all beach houses, this one has a bit of rust here and there, and other signs that salt water leaves on decks, door knobs, windows etc. This is part of the charm -- it feels like a house that loves being at the beach. Rates are subject to change until reservation is confirmed. Nightly and monthly rates are available in the off-season. Nightly rates decrease with each additional night up to 7. Monthly rentals are available November through March at the rate of $3,300 per month. Contact the owner for more information. If looking for a last-minute booking, the night minimum may be reduced at the owner's discretion.